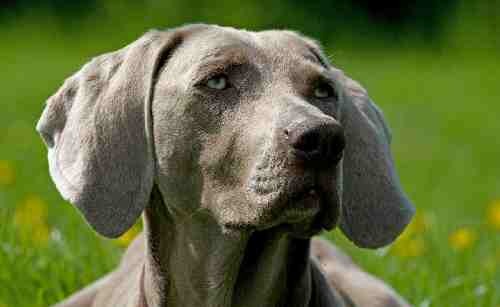 The Weimaraner Agility League, the only competition exclusively for Weimaraners, is now going into it's 13th year. Membership doesn't cost much per year and is open to anyone who is currently competing with a Weimaraner. 1. Entries to be received prior to points being submitted. The League starts on 1st January each year. 2. Points will be awarded as of 1st January until 31st December. 30 points for 1st place down to 1 point for 30th place for all classes held at a KC licensed event. Special classes at KC shows are also included. Clear Round or receive a special rosette, this will gain one point. Non KC shows/events e.g. club competitions, and unaffiliated agility shows etc will be allocated points as follows: 20 points for 1st place down to one point for 20th. Details of the above and points awarded for pairs and team placings are detailed below and will be on your points record form issued once you subscribe. 3. The entry fee is £3.50. This will cover the cost of the trophies and administration. An annual donation has been arranged and The Weimaraner Agility League regularly sponsors The Dogs Trust Oakfield Old Dogs Home. Additional donations to charities may be made (funds permitting!). 4. It is the handler’s responsibility to forward any points gained each month to enable them to be added to the point’s table. Please try and be fair and submit your points regularly so members can gauge how well they are doing or not as the case may be!! Please keep a record of placings for yourself and for verification at the end of the year for those placed. 7. In the event of a draw the highest overall placing in the year will win. 8. Grades determined at time of subscription and stay the same until end of the year. 9. Monthly League Tables will only show overall position. Group placings will be calculated at the end of the year and displayed on www.Agilitynet.com, and the Weimaraner Agility fb page.